Currency movements were mixed in the last week of May, and now a very busy week awaits traders: rate decision in Australia, Canada, the UK and the Eurozone are due alongside top-tier US events culminating in the all-important NFP report on Friday are the market movers on FX calendar. Here is an outlook on the highlights of this week. US ISM Manufacturing PMI: Monday, 14:00.US manufacturing sector activity edged up in April to 54.9 from 53.7 in March, beating forecast of a 54.3 reading. According to the report, new orders remained unchanged at 55.1, while employment climbed to 54.7 from 51.1 in the previous month. Most responders were positive mainly due to strong demand out of China. US manufacturing activity is expected to advance to 55.7 this time. 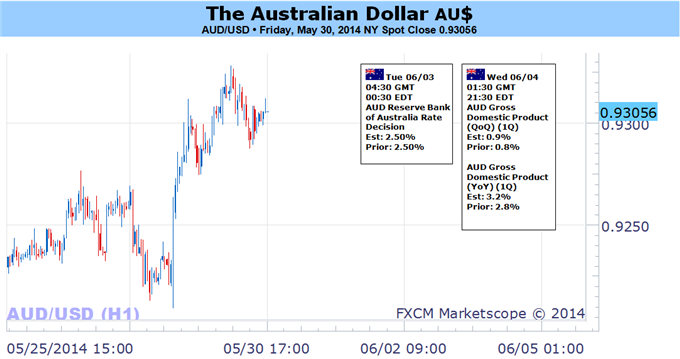 Australian rate decision: Tuesday, 14:00. The Reserve Bank of Australia signaled it would maintain low interest rates in the coming months as inflation is contained and the economy adjusts to fewer resource projects. Growth is expected to slow down after mining investment sharply plunged. Therefore, the 2.5% rate and the accommodative monetary policy are expected to stay for the rest of the year. No change in rates s expected now. Australian GDP: Wednesday, 1:30. The Australian economy expanded faster than expected last quarter, despite a decline in business investment. GDP edged up 0.8% in the last quarter of 2013, beating expectations for a 0.7% rise. Consumer spending picked-up as well as exports and housing transactions. Low interest rates and a recent decline in the exchange rate had a significant positive impact on growth. GDP growth in the first quarter of 2014 is expected to advance by 0.9%. US ADP Non-Farm Employment Change: Wednesday, 12:15. Private sector employment in the US expanded by 220,000 jobs in April following 209,000 in the prior month. The majority of new positions were created in the construction industry gaining 19,000 jobs over the month, compared to 21,000 in March. Manufacturing remained slow adding 1,000 jobs in April, down from 4,000 in March. Analysts expected a lower job addition of 203,000. The impressive gain was well above the twelve-month average, indicating the US job market is improving. Private sector employment is expected to show a 217,000 jobs addition in May. US Trade Balance: Wednesday, 12:30. The U.S. trade deficit contracted in March to $40.4 billion from $49.8 billion in February thanks to a rise in exports but the small improvement did not help GDP in the first quarter, plunging into negative territory posting the first contraction in three years. U.S. trade deficit is expected to widen to $40.8 billion. Canadian rate decision: Wednesday, 14:00. The Bank of Canada maintained its overnight interest rate at 1%, keeping it unchanged for the last 29 policy meetings. However, the bank left the door open for a rate cut. Bank of Canada governor Stephen Poloz was less concerned with low inflation, high house prices and household debt, claiming recovery is consistent and will improve amid stronger US demand. Rates are expected to remain unchanged at 1%. Canadian GDP slightly disappointed. US ISM Non-Manufacturing PMI: Wednesday, 14:00. The U.S. service sector continued to advance in April, expanding to 55.2 from 53.1 in March. Analysts expected a lower reading of 54.3% in March. Responders were positive about business conditions and the current state of the US economy. The strong release indicates that the US economy is advancing and strengthening in Q2. Manufacturing activity in the US private sector is expected to gain further momentum and reach 55.6. UK rate decision: Thursday, 11:00. Stronger voices calling to raise rates were heard in the last BoE meeting in May. BoE Governor Mark Carney, who has supported the low rate policy, said that the Bank is getting close to raise borrowing costs. However the estimates suggest a hike may come in a year’s time while other analysts believe a higher rate will executed in the first three months of 2015. Rates are expected to remain unchanged at 0.50%. Eurozone rate decision: Thursday, 11:45, press conference at 12:30. The ECB is likely to act as promised and to keep the pressure on the euro. While the euro dropped throughout May due to Draghi’s comment last time, the exchange rate is probably still too high. This keeps inflation low. In addition, money supply is squeezing. A cut of 10 to 15 basis points is likely in both the main lending rate and the deposit rate. In addition, the ECB could accompany this move with some new kind of LTRO. While the governing council is likely to keep the QE powder dry, Draghi could certainly provide some more details about such a potential program, making it clear that the option is on the table. A negative rate by such a major central bank is uncharted territory. In addition and despite all the preparations, Draghi’s action and words are not fully priced in. Draghi could drag the euro down once again. US Unemployment Claims: Thursday, 12:30. The number of initial jobless claims dropped drastically last week to nearly the lowest level in seven years reaching 300,000 claims. The 27,000 drop was far better than the 321,000 forecasted by analysts, indicating hiring is picking up despite the GDP contraction posted in the first quarter. Employers are confident enough to keep staff reducing the number of layoffs. Unemployment claims is expected to reach 314,000 this time. Canadian employment data: Friday, 12:30. Canada’s unemployment rate remained unchanged in April at 6.9%, despite a loss of 29,000 jobs compared to March. Employment worsened in the provinces of Quebec, New Brunswick, Newfoundland and Labrador and in Prince Edward Island, while it increased in Saskatchewan. The unemployment rate remained the same because labor force participation fell 0.2% to just over 66%.Canada’s labor market is expected to increase by 12,300 jobs with no change in the unemployment rate. US Non-Farm Employment Change and Unemployment rate: Friday, 12:30. The US labor market created 288,000 jobs in April, well above the consensus forecast of 215,000 new positions, posting the best reading since January of 2012. The surprising addition pushes the unemployment rate down to 6.3% from 6.7% in March, much better than the 6.6% estimated by analysts. Private sector job creation strengthened and the government started hiring again after many months of layoffs. Overall, the US job market is stronger and consumer spending also improves boosting economic activity. US economy is expected to show a 219,000 jobs addition in May, while the unemployment rate is predicted to rise to 6.4%. 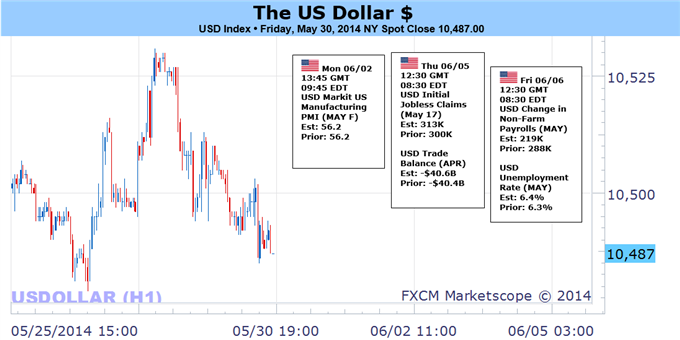 The US Dollar rally showed signs of slowing as the DJ FXCM Dollar Index failed to hold multi-month highs. Traders look to a critical European Central Bank decision and US Nonfarm Payrolls report to decide direction in Dollar pairs through the week ahead. Dollar gains could reverse as our Senior Strategist notes it is coming on an important cyclical turning window. And indeed, the Dollar has arguably lost a key source of support as US Government Bond yields tumble—limiting the appeal of betting on further Greenback gains. 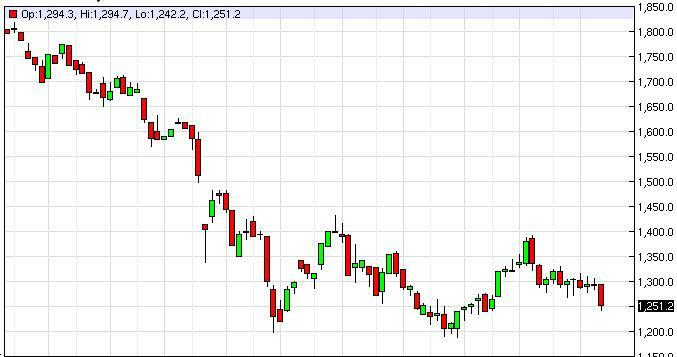 It would be fitting if such a USD pullback occurred on the highly-anticipated ECB decision or the US NFPs labor data. What out of either event could realistically force the Greenback lower? The weight of expectations threatens to push the US Dollar further off of recent peaks versus key counterparts. Bloomberg News surveys show that most expect the European Central Bank to cut interest rates, which has in turn helped push the Dollar higher versus the Euro. Yet any disappointment could easily force the Euro/USD exchange rate further off of multi-month lows. Consensus forecasts for US NFPs employment figures paint a similarly optimistic picture for the US currency. Bloomberg News survey results predict the economy added 220k jobs in the month of May as the Unemployment rate stuck near multi-year lows. This would represent the fourth-consecutive month of at least 200k net jobs, and optimistic expectations leave ample room for disappointment. Of course the ECB and NFPs could match market expectations and keep the Dollar rally alive. Yet it’s worth noting recent futures positioning data showed large speculators at their most bullish USD versus the Euro since the EURUSD set a key low in July, and positioning is likewise growing stretched in our retail trader sample. In other words: beware of the potential for a short-term sentiment and price extreme across major US Dollar pairs. Last edited by 1Finance; 05-31-2014 at 06:03 AM. 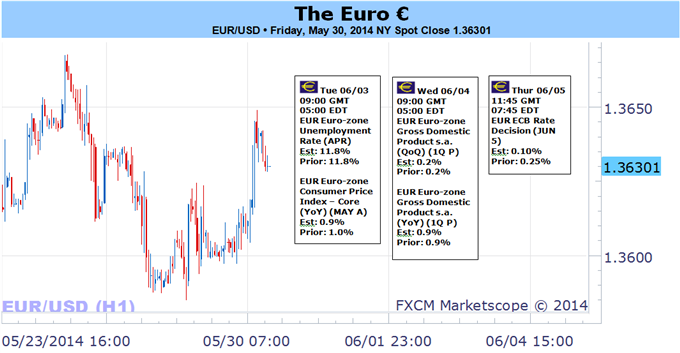 The Euro showed signs of life as it bounced off of fresh multi-month lows and ended a three-week losing streak. Yet traders await a critical European Central Bank interest rate decision to drive volatility in the week ahead. Recent futures data showed large speculators headed into the week at their most short Euro since it bottomed in July of last year. Traders were likely increasing their bets on Euro weakness as the ECB is widely expected to cut interest rates in their coming meeting. Expectations often beget disappointments, however, and a rush towards Euro selling warns that the single currency may bounce on any ECB surprises. All eyes turn to central bank President Mario Draghi as he said the ECB was “ready to act” at its next meeting. A Bloomberg News survey shows the majority of economists polled believe the bank will cut its Main Refinancing Rate to further record-lows and push its Deposit rate into negative territory. If the ECB fails to cut either rate it seems obvious that the Euro might rally. Beyond that, however, likely outcomes seem much less clear. Derivatives traders have pushed forex volatility prices near record-lows across the majority of US Dollar and Japanese Yen pairs. And yet EURUSD 1-week prices have spiked near their highest levels of the year. Any unexpected results from the European Central Bank would likely be the catalyst for important Euro moves, while end-of-week US Nonfarm Payrolls data could likewise spark significant EURUSD swings. The GBP/USD looks poised to resume the bullish trend carried over from the previous year as the Bank of England (BoE) shows a greater willingness to normalize monetary policy sooner rather than later. Indeed, the BoE policy meeting highlights the biggest event risk for the British Pound as there appears to be a growing rift within the Monetary Policy Committee (MPC), but the sterling remains vulnerable ahead of the June 5 interest rate decision as U.K. Mortgage Applications are expected to slow further in April. Nevertheless, it seems as though BoE board member Martin Weale may make a greater push to raise the benchmark interest rate ‘sooner rather than later’ as he sees borrowing costs increasing by a full percentage-point over the next 12-months, while Mr. Charles Bean appears to be turning increasingly hawkish as the Deputy Governor anticipates real wage growth to ‘gradually’ increase in the second-half of the year. 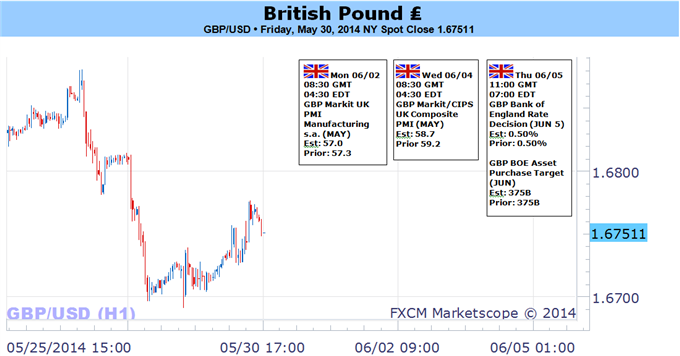 With that said, the BoE Minutes due out on June 18 may reveal a growing dissent with the central bank as Governor Mark Carney remains in no rush to normalize monetary policy, but the rate decision may have a limited impact in driving near-term price action for the GBP/USD should the central bank once again refrain from releasing a policy statement. As a result, a further shift in the BoE policy outlook should heighten the appeal of the British Pound, and the GBP/USD appears to be on course for a higher-high as the Federal Reserve remains reluctant to move away from its zero-interest rate policy (ZIRP). On the domestic front, the spotlight is on a policy announcement from the Reserve Bank of Australia. The central bank is expected to keep the benchmark lending rate unchanged at 2.50 percent. That will put the focus on the statement released following the sit-down. A dovish tone in minutes from May’s meeting undermined speculation about forthcoming interest rate hikes, sending the currency lower. Australian economic data has increasingly underperformed relative to market expectations since then, suggesting Glenn Stevens and company will be in no hurry to change their tune. Meanwhile, GDP figures are set to show the pace of output growth accelerated in the first quarter and China’s PMI data is expected to reveal a pickup in the pace of factory-sector activity in May. That is likely to keep stimulus expansion bets at bay, helping to cement the status quo wait-and-see setting of monetary policy both in practice and in the minds of investors. Sizing up the macro landscape, a critical mass of high-profile event risk informing the outlook on Federal Reserve policy looms ahead. As we’ve discussed previously, the fate of the FOMC’s effort to “taper” QE asset purchases with an eye to end the program this year – paving the way for interest rate hikes – has been a formative catalyst for the markets this year. While last week’s US GDP data revealed more dismal first-quarter performance than was previously expected, Janet Yellen and her colleagues on the policy-setting FOMC committee have regularly dismissed the first three months of the year as a temporary soft patch. US economic data began to steadily improve relative to consensus forecasts in early April, seemingly supporting the central bank’s position. Manufacturing- and service-sector ISM figures, the Fed’s Beige Book survey of regional economic conditions and the obsessively monitored Nonfarm Payrolls report are all due to cross the wires in the coming days. Continuation of the supportive trend in US news-flow may help scatter any lingering doubts about the approaching end of asset purchases and subsequent tightening. That may narrow the Aussie’s perceived yield advantage and drive broader risk aversion, all of which bodes ill for the currency. Gold prices are virtually unchanged on the week with prices off by a mere 0.1% to trade at $1291 ahead of the New York close on Friday. Prices have continued trade within a tight range despite ongoing strength in the US dollar and broader equity markets. Nevertheless, gold remains at a critical juncture and the technical picture continues to suggest that a break of a multi-week consolidation pattern is imminent as we head into the close of May trade. In light of the recent strong demand for US Treasuries, it’s disconcerting that although gold has largely moved in tandem Treasuries since the start of the year, it has been unable to participate in the bond rally since April. This condition suggests that the gold market remains vulnerable in the near-term and with the long bond coming off key near-term resistance at the 61.8% retracement from the decline off the 2012 record highs, further weakness in Treasuries could put added downside pressure on gold prices. Looking ahead, the preliminary 1Q GDP print highlights the biggest event risk for the week ahead with consensus estimates calling for a downward revision to reflect an annual contraction of 0.5% q/q. With that said, a dismal growth read may dampen the appeal of the US Dollar and spur increased demand for gold as interest expectations get pushed out. Watch for developments in the bond market and the greenback for guidance with the recent price action in gold warning of a decisive move heading into the monthly close. From a technical standpoint, our outlook remains unchanged from last week. “Gold has continued to trade into the apex of a multi-week consolidation pattern off the April highs and a break-out ahead of the May close is in focus. A break below 1260/70 is needed to put the broader bearish trend back into play targeting $1216/24 and the 2013 lows at $1178. Interim resistance and our near-term bearish invalidation level stands at $1307/10 with a move surpassing $1327/34 shifting our broader focus back to the long-side of gold. Bottom line: look for a decisive break of this pattern next week with a move surpassing the May opening range to offer further clarity on our medium-term directional bias. The broader outlook remains weighted to the downside sub $1334. 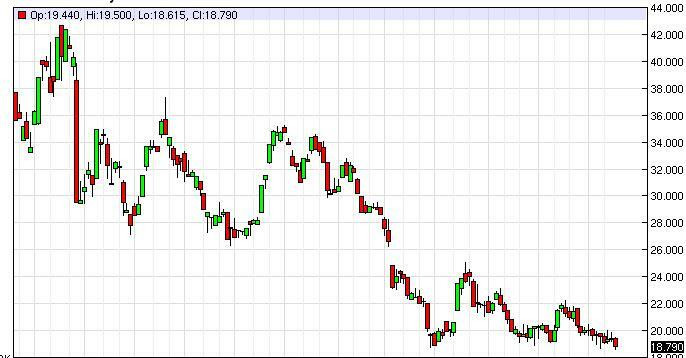 The silver markets fell during the course of the week, testing the absolute lows that the market has had recently. With that being the case, silver really looks weak here, and as a result we don’t really feel comfortable buying it at this point in time. If we got a supportive candle down there, we can’t think of a better place to do so, but we just don’t have it so therefore we are more than comfortable just sitting on the sidelines as this market looks far too dangerous to be on the long side of. However, fresh new lows could lead to a nice selling opportunity for a move down to about $15. 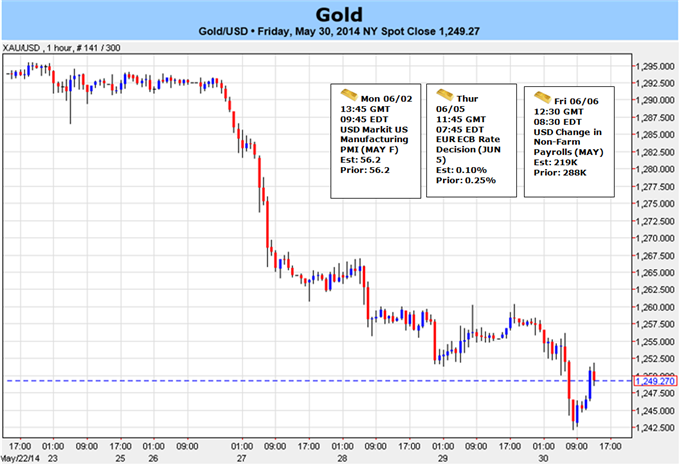 Gold markets fell rather hard during the week, testing the $1250 level. It’s obvious to us know that the market has a bit of support in that general vicinity, and there is certainly a lot of support down near the $1200 level. With that, we are a bit hesitant to sell this market, especially with a longer-term mindset. If we get below the $1200 level, we feel that this market then will head to the $1000 level. As far as buying is concerned, we do not have a buy signal at this point in time. 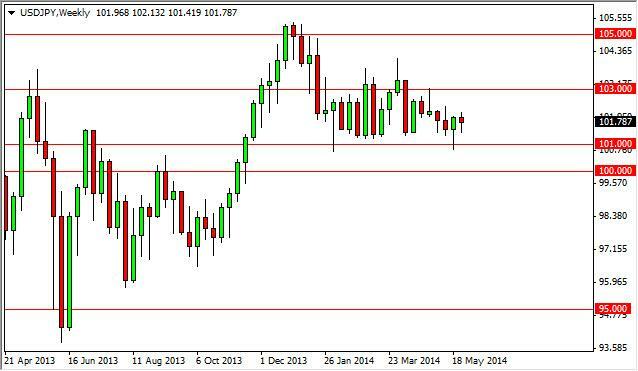 The USD/JPY pair had a back-and-forth week, ultimately settling on a negative candle. However, this candle is shaped a bit like a hammer, so we feel that the market will ultimately go higher from here. On top of that, we are in a larger consolidation area and as a result we expect that to continue. The market should hit the 103 level fairly soon, and therefore we think buying as appropriate. We also recognize that there is a significant amount of support at the 101 level, extending all the way down to the 100 level. 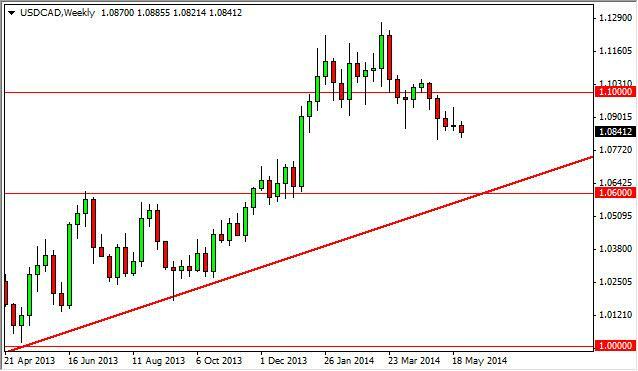 The USD/CAD pair fell slightly during the course of the week, as we continue to press against the 1.08 level. This area has been supportive lately, but ultimately we believe that the real support is lower. A supportive candle below this current area would be reason enough to start buying, and as you can see on the chart we also have an uptrend line that we are nowhere near yet. That being the case, we feel that this market will probably fall, but quite frankly are not very interested in it at the moment.